Image caption The UK apologised to Mr Belhaj for its actions and conceded that he suffered "appalling treatment"
Abdul Hakim Belhaj is a former Libyan rebel commander, who has received an apology from the British government for its actions contributing to his rendition to Libya, detention and torture in 2004. In August 2011, he stood victorious inside Col Muammar Gaddafi's Bab al-Aziziya compound after fighters from his Tripoli Brigade broke through the defences of the ousted leader's fortress. But the victory was a long time coming for the staunch anti-Gaddafi fighter, who spent seven years in the city's notorious Abu Selim prison, where he says he was regularly tortured. He and his wife, Fatima Bouchar, say the CIA abducted them in Thailand and handed to the Gaddafi regime following a tip-off from British intelligence. He spent six years taking legal action in UK courts against British officials, including former Foreign Secretary Jack Straw over claims that Mr Straw signed papers authorising the move. The UK apologised for its actions on 10 May. Prime Minister Theresa May said Mr Belhaj and Ms Bouchar had suffered "appalling treatment". Ms Boudchar, who was pregnant at the time of her rendition, will receive an out-of-court settlement of £500,000. Mr Belhaj had fought against Col Gaddafi for many years and had been involved with an Islamist group's attempt to overthrow the Libyan leader in the late 1990s. Mr Belhaj - known in the jihadi world as Abu Abdullah al-Sadiq - commanded the now defunct Libyan Islamic Fighting Group (LIFG). The group was formed in 1990 by Islamist Libyans who had fought in Afghanistan against Soviet forces in the 1980s. The LIFG waged a three-year low-level insurgency mainly based in eastern Libya, and staged three attempts to assassinate Col Gaddafi in 1995 and 1996, according to Middle East analyst Omar Ashour of Exeter University. By 1998, the group was crushed. Most of its leaders fled to Afghanistan and joined forces with the Taliban. There, Mr Belhaj is alleged to have developed "close relationships" with al-Qaeda leaders and Taliban chief Mullah Omar, according to an arrest warrant issued by the Libyan government in 2002. The warrant says that he was based in Jalalabad, Afghanistan, from where he ran and financed training camps for Arab mujahideen fighters. It notes that he was born in 1966 in the Souq al-Jumaa area of Tripoli and studied at al-Fateh University, where press reports say he earned a civil engineering degree. The warrant says Mr Belhaj travelled widely, spending time in Sudan, Pakistan, Syria and Iran. He is also said to have visited Turkey, London and Denmark. After the 9/11 attacks and the US-led invasion of Afghanistan in 2001, he and most of the LIFG leaders fled that country as well. His 2011 incarnation as a top Libyan rebel commander, widely credited with chasing the Gaddafi family out of Tripoli, propelled him to international attention - along with his account of being tortured under the controversial CIA interrogation programme known as rendition. Files unearthed from Col Gaddafi's intelligence archives and seen by the BBC documented Mr Belhaj's capture by the CIA in Bangkok in 2004, and his forcible repatriation to Libya. This happened during the wake of the 9/11 terror attacks in 2001, when the US and its allies were racing to understand jihadist groups they had previously not done enough to track. British intelligence agencies wanted to know more about LIFG, which had attempted to overthrow the Gaddafi regime in the 1990s. The UK's plan was to convince Colonel Gaddafi to not only stop threatening the West, but to also provide information on LIFG members and their potential links to al-Qaeda. The unearthed files showed how one senior MI6 officer, Sir Mark Allen, sought to convince Moussa Koussa, who was Gaddafi's intelligence chief, to work with the West. What Koussa wanted was respect and international recognition for Gaddafi and intelligence that would help capture LIFG leaders, like Mr Belhaj, on the run. By 2004, the documents showed London telling Tripoli that Mr Belhaj had been deported to Malaysia after being apprehended by the Chinese authorities. The US intervened and told Tripoli it was going to help secure Mr Belhaj on the basis that it would get the opportunity to interrogate him. Peter Bouckaert, a spokesman for Human Rights Watch - which originally obtained the documents - explained the circumstances of Mr Belhaj's transfer. "He was rendered by the CIA, he was captured, abducted together with his pregnant wife and flown on the so-called black flight to Tripoli for his interrogation," he said. Mr Bouckaert said Mr Belhaj was one of eight or nine suspects who were abducted and handed over to the Libyan intelligence service. "From the files it's very clear [CIA agents] were present in some of the interrogations themselves." Mr Belhaj told the Guardian newspaper that in Abu Selim prison: "I was injected with something, hung from a wall by my arms and legs and put in a container surrounded by ice. They did not let me sleep and there was noise all the time." Mr Belhaj told the BBC that after the CIA and Britain's MI6 intelligence agency got him to Tripoli in March 2004, they did not witness his torture, but interrogated him afterwards. "What happened to me was illegal and deserves an apology," he told the BBC's Jeremy Bowen in Tripoli in 2011. He was freed from Abu Selim Prison in 2010 under a "de-radicalisation" drive championed by Saif al-Islam Gaddafi, son of the then Libyan leader. In 2012, the BBC revealed the UK government had authorised the rendition of Mr Belhaj and his wife, though it was not clear at what level. And on 15 April 2012 the Sunday Times published an article quoting sources alleging the authorisation had come from Mr Straw. Mr Belhaj and his wife began seeking damages from the former minister for the trauma they say they suffered. Papers were also issued in the High Court to sue the UK government, its security forces and senior M16 officer Sir Mark Allen for damages in the case. UK ministers at the time denied any complicity in rendition or torture. Mr Straw said he could not comment on the claims because of an ongoing police investigation into the UK's alleged role in rendition. The CIA has previously said it should come as no surprise that the US worked with foreign governments to help protect America from terrorists. The government accepted the couple's account of what happened in May 2018. In a letter read out in the Commons, Prime Minister Theresa May said UK actions had contributed to the couple's capture and that the government had "shared information" about them with "international partners". The letter said: "It is clear that you were both subjected to appalling treatment and that you suffered greatly, not least to the dignity of Mrs Boudchar, who was pregnant at the time. Mrs May said the UK "should have done more to reduce the risk" of the pair being mistreated, adding: "We accept this was a failing on our part. On behalf of Her Majesty's government, I apologise unreservedly." Ms Boudchar described the day's events as "historic" and called on world leaders to show solidarity for those who have suffered injustice "even if they're of different religion or culture". BBC home affairs correspondent Dominic Casciani says the settlement is the first time ministers have apologised for a specific act involving British security agencies. 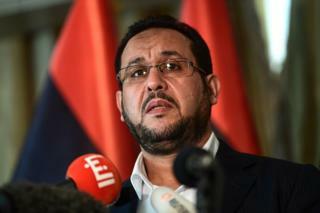 Mr Belhaj has moved out of the public spotlight since his days as a Libyan dissident and rebel fighter. When the rendition claims first surfaced in 2011, after the fall of the Gaddafi regime, Mr Belhaj said they would not stop Libya's interim leadership at the time - the National Transitional Council - from having "orderly relations" with the US and the UK. The NTC dismissed any suggestions that Mr Belhaj was a former al-Qaeda sympathiser, following reports in the international media as well as statements attributed to Saif al-Islam Gaddafi. "NTC members have stated time and again that the revolution has no links to al-Qaeda," NTC spokesman Al-Amin Belhaj told Al-Jazeera Television in 2011. "Everyone knows who Abdul Hakim Belhaj is. He is a Libyan rebel and a moderate person who commands wide respect. Unfortunately, some circles in the West repeat these claims," he added. Asked about his Islamist links, Mr Belhaj told the BBC that he was always an anti-Gaddafi fighter, but insisted that he was never an al-Qaeda member. Mr Belhaj contested the 2012 Libyan elections as a candidate of the al-Watan (Homeland) Party, which won no seats. He has moved out of the public spotlight in recent years and has allegedly turned his revolutionary connections into vast wealth and influence, the Washington Post reports. But BBC North Africa correspondent Rana Jawad says international mediators see him as a figurehead during the current round-table talks on reconciliation. Today, he shuttles between Turkey and Tripoli, and his current political and business dealings remain a secret. According to our correspondent, he is now an enigma to many Libyans.